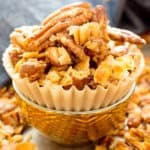 Sweet ‘n Salty Nut Clusters Recipe (V, GF): an easy recipe for crunchy nut clusters, lightly glazed and bursting with salty ‘n sweet flavors. Made with healthy ingredients. Vegan, Gluten-Free, Dairy-Free, Paleo. Can you believe it’s the middle of October already?!? You know what that means right? Prepare for ALL the chocolate to hit this ‘lil blog in a second. But before we get going on all of that… I thought I’d take a little fall-inspired chocolate break for… drumroll please… NUTS! You thought I was gonna say all things pumpkin, right? Meanwhile, every year, Erik and I set aside a few days—okaaaaay, fine, a week or two – to make treat baskets for the fam for Halloween, sometimes Thanksgiving (if we’re not all getting together in one location), and definitely Christmas. Needless to say, it’s a train-wreck of chaos, baking sheets every-which-where and chocolate drizzles all over everything. 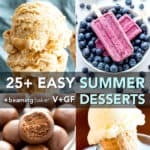 So this year, since I also know that y’all are gonna be in this type of jam soon, too, I thought it’d be the perfect time to start sharing some super easy & equally impressive edible gifts! 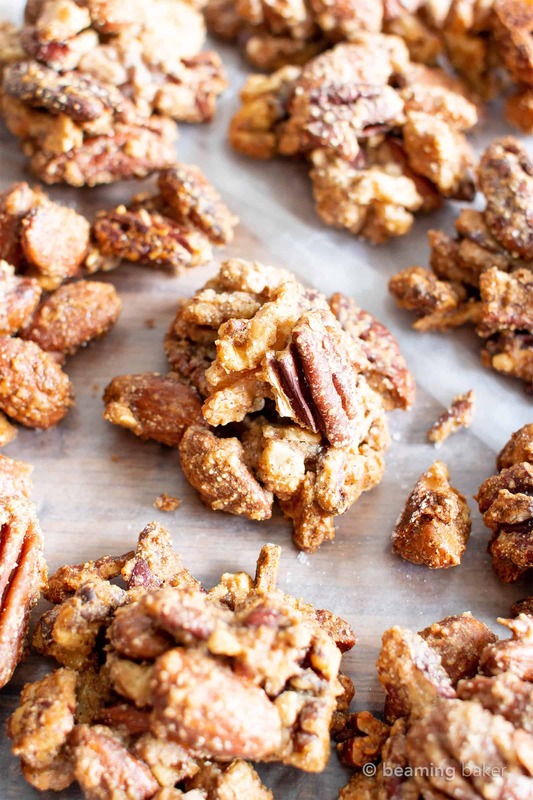 Enter: my Sweet ‘n Salty Nut Clusters Recipe. 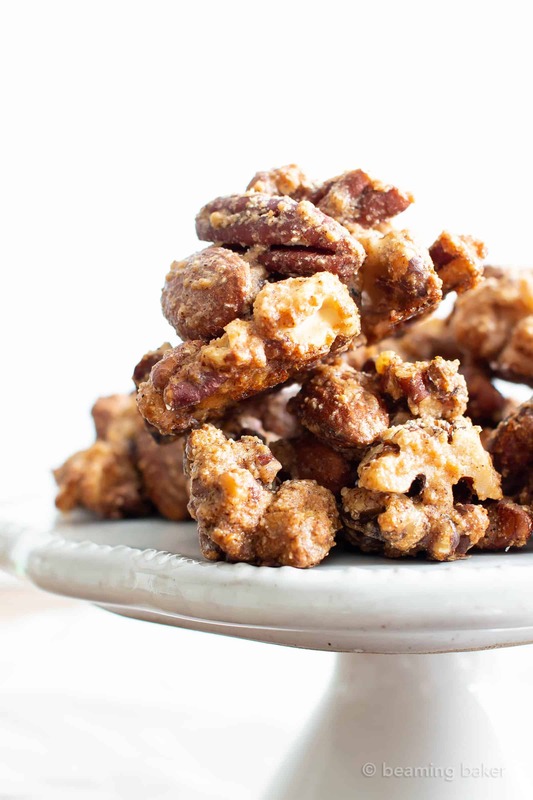 These friggin’ delish nut clusters come together in no time at all. You’ve got just a few minutes of prep, then you’re off to the couch, to cool off and hydrate while these babies bake in the oven. Not to worry, I’ve tested them thoroughly for feedback from my best taste testers (my mom and my sister). 😉 Better yet, my little nephew, Dylan aka PB, LOVES them. And let me tell you, if I measured the value of my kitchen skills on whether or not this little sir liked everything I made for him… well, you’d be seeing a blank page or a 404 error right now instead of a fully-functional food blog. Ahem. 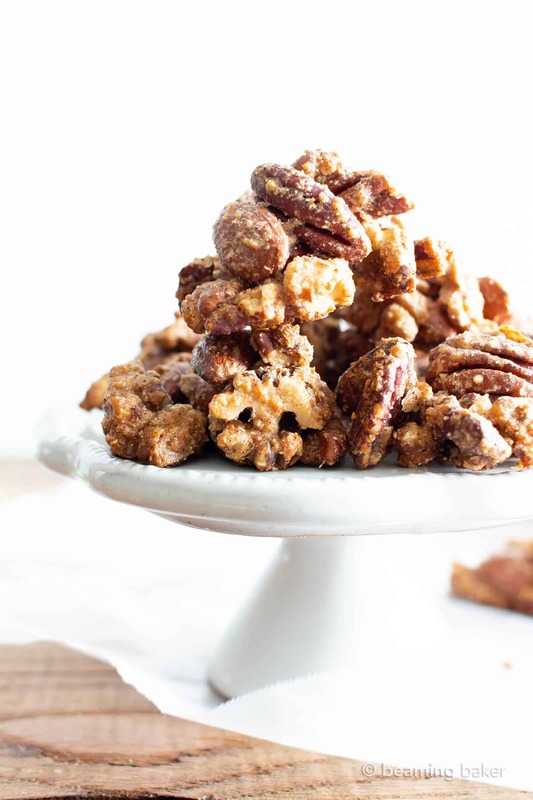 Try these these sweet ‘n salty nut clusters and let me know what you think! I’m already brainstorming some ideas off of this recipe, but I wanna see how these go first. Meanwhile, we at Beaming Baker (Erik and I lol) are preparing for Holiday Central Madness in T-minus 5 seconds. 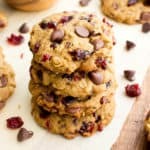 … including these: vegan chocolate chip cookies, gluten free maple pecan pumpkin muffins, no bake chocolate peanut butter bars. 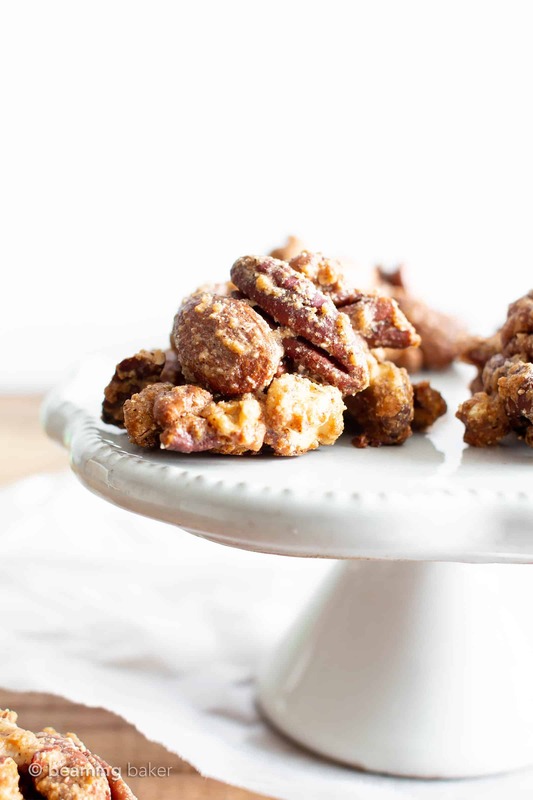 soon to be your favorite way to learn how to make nut clusters! 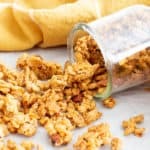 Sweet 'n Salty Nut Clusters Recipe (V, GF): an easy recipe for crunchy nut clusters, lightly glazed and bursting with salty ‘n sweet flavors. Made with healthy ingredients. Protein-Rich, Vegan, Gluten-Free, Dairy-Free, Paleo, Clean Eating. Preheat the oven to 325°F. Line a large baking sheet with parchment paper or greased foil. Set aside for later. Add all ingredients to a large bowl. Using a rubber spatula, fold until well mixed. Drop spoonfuls of mixture onto the prepared baking sheet, creating clusters with enough room in between each cluster to let air through. Bake for 16-22 minutes. Mine took 20 minutes. Clusters will crisp up while cooling. Sprinkle sea salt onto clusters. Inspired by my Homemade Chunky Paleo Granola with Clusters. Try my 5 Ingredient Homemade KIND Nut Bars and my 4 Ingredient Healthy Homemade Vegan Gluten Free Granola. - *You may substitute this with unblanched almond meal. - Storage notes: Store in an airtight container for 1-2 months at room temperature. I would eat all of these they look fantastic! 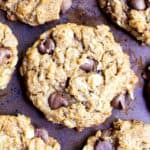 These sure look delicious and easy to make! What a great snack idea! Love the autumnal twist of them too. Very excited to make these very soon! I would love to be a gifted some of these nut clusters. Sweet and salty flavor combination is the best! Right!!? I’m all about gifting them this holiday season! What a healthy, delicious snack! My son would love these packed in his lunch box – especially with the maple and cinnamon flavors – yum! Thank you! I can tell you, they’re kid-approved! 🙂 Hope y’all enjoy! That’s awesome to hear, Edyta! 🙂 Enjoy! You had me at sweet and salty! These sound seriously addicting! Haha yess! Hope you enjoy them! Thanks! 🙂 Yes, that should work. Enjoy! ???? Hi! I have a difficulty finding maple syrup, so I usually use mollases or agave for baking or sweetening up cereal, etc. Will agave work in place of maple syrup in this recipe? I wouldn’t want it to change the desired texture of the cluster. Hi Shiksha! Hm, not sure as I haven’t tried with either of them. I’d say try doing a mixture of both (since agave is a bit thinner and molasses is thicker). Let me know how it turns out! YUM! 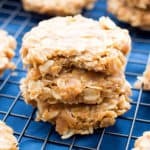 This is such a delicious and healthy snack option! Need to make soon! Great snack! Yum Yum Yum! Looks so vibrant and lovely! I can’t WAIT to try this! Thank you for this great recipe! This would be the perfect snack for my kid’s lunch box. Yum! Woohoo! I bet they’d love it! ???? These are perfect for holiday gifts! So easy too! Agreed! Edible holiday gifts are totally the best! ???????? 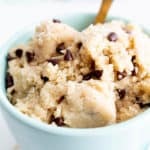 I wouldn’t have thought to include almond flour, love this! It works so perfectly in these. Thanks Kimberly! Awww I’m so in love with this recipes ❤❤ One of the best snack ever!!! Thanks for sharing this, Demeter ???? what a great after school snack for the girls! WOWSERS!!! These are soo good. Not eating refined sugar…. I have missed all those delicious butter toffee nuts, nut clusters, and anything remotely nutty and sweet. It’s been years and I still occasionally dream about them. I couldn’t make this recipe fast enough! 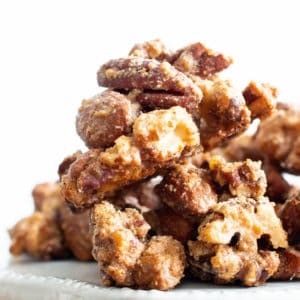 It hit the mark big time and I am sooo pleased that I can have these yummy nut clusters and they are just the perfect amount of sweetness. Even my man (who doesn’t usually like ‘my’ desserts), loved these. I have made many of your recipes because I like the natural real food ingredients you use and your sweetness level. This one is a huge blessing for a nut lover. Oh, and I used soaked and dehydrated nuts (pecans, cashews and almond) and they worked perfectly. Yay! ???? I am so happy to hear how much you enjoyed the clusters! I know, there’s really nothing quite as satisfying as some sweet + salty nuts. ???? Thank you for taking the time to share all these kind words with me! Mine did not come out as clusters, but still just as amazing! Love the flavor. Hi Elaine! For this recipe, the stacks you create are the clusters. 😉 So you’ll have to form them yourself in the “spoonful” step. Glad you enjoyed!